If you happen to be a regular reader of this blog (and I really hope there are some, excluding the multitude of bots I know are here (just for them, a quick joke - *bleep, bleep, bloop, beep*)), and you find that your tastes generally line up with mine, you don't really need to read this review. Just go listen to the series, it's basically amazing. Have they gone? Excellent. Bunch of nerds. 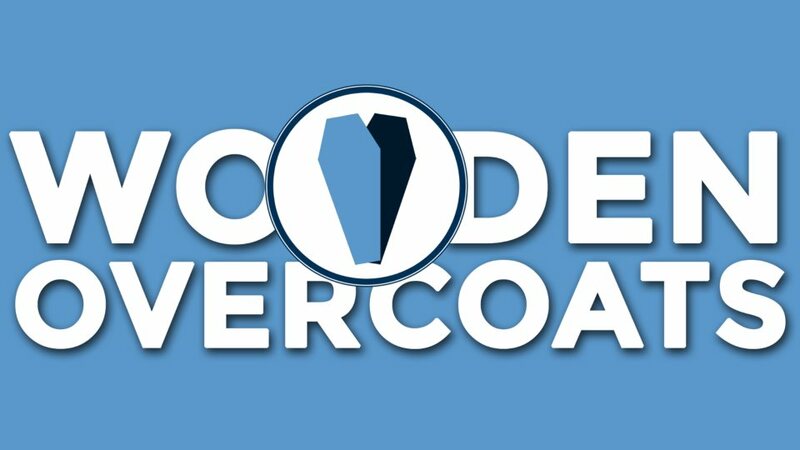 Wooden Overcoats is set in Piffling Vale, a little village on Piffling Island, found in the English Channel. The Funn twins, Rudyard and Antigone, run an undertaking firm, with Rudyard being the public-unfriendly face, and his sister acting as embalmer par excellence. Along with their assistant, Georgie Crusoe, they run what can best be described as the only funeral home on the island. This does allow a certain slapdash approach to burying people, with the only real quality controls being Rudyard's persistent catchphrase of "We get the body in the coffin in the ground on time." Of course, the Funn twins can't take this lying down (that's a bit of a risk in a mortuary), and so begins a vicious one-sided feud. One-sided because even though Rudyard is the sort of rude chap who answers the phone with a grumpy "Now look here! ", rather than the more traditional "Hello! ", Chapman is a very cheerful soul who tends to not let anything bother him. Of course, we've got a wider ensemble cast of the various island dwellers, not the least of which is the narrator, Madeleine, a mouse, but they're all slightly mad in entertaining ways. There's also a few unexpected voices who pop up in this, my favourite of which is probably Andy Hamilton's, for fairly obvious reasons. Overall, there's something of a Stoneybridge feel to the village. The writing is very sharp, with the dialogue always being both well varied between different characters, but with a few nice running jokes that sit in the that gap between annoying and comforting. Antigone's tendency to loom out of the shadows is a particular favourite, though I also enjoy her self-contradicting sentences. Her neurotic persona probably makes her the most enjoyable character in my mind. Chapman is a nice twist on the antagonist being the only sane man, with hints of a mysterious backstory, and a couple of unexpected dark moments that give him more depth than you might expect. His superhuman ability to achieve more or less anything is also a constant comic delight. Granted, I'm still binging the first season. And there's three. But I can only see it getting better, rather than worse. Probably one of the best audio drama/comedies I've listened to this year, and I fully intend to binge my way through the rest of it. If you're any sort of radio comedy fan, you should definitely try this.